Topping the exquisite script by Quintos in “Angry Christ” is the sweeping latitude that the material had in initially sketching in an ambiguous but studied manner, and eventually painting, the grand psychological landscape of the imagined painter Ossorio: his lesions, loneliness, loves, longings, lusts, brilliance, virtuosity, and his agony and conflicts with his Catholic faith. 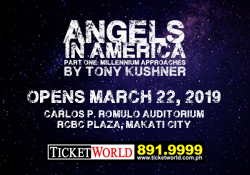 The supreme grandeur of the “Angry Christ” production is anchored in its multi-layered plot, embroidered with tiny twists and minor turns, where Quintos discreetly displayed the Murakami in him. How? Quintos bestowed upon the imagined painter Ossorio the burden of many Murakami men, their “hearts torn” and their “insides bleeding” mainly because of unanswered prayers. Even the sakada men and the poet-labor leader were not exempted. These characters were terribly tormented, either by jagged envy or decaying social situation. 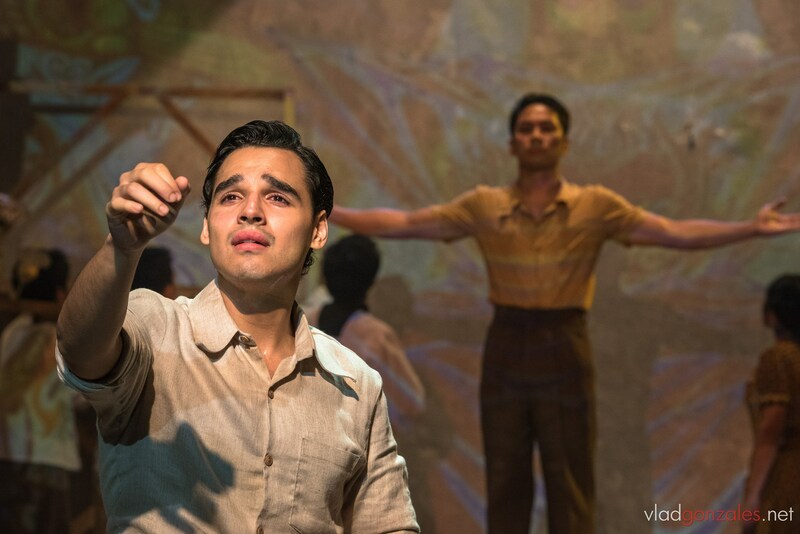 Director-choreographer Dexter M. Santos’ skillful pacing of the narrative was a forceful factor in the soaring success of telling the fate of the imagined Ossorio. At various junctures, an art lecturer discussing “The Last Judgment” and its little known details provided key historical background on the most important work of the real life Alfonso Ossorio. The mural is located at the sanctuary of St. Joseph, the Worker, Chapel, at the Victorias Milling Corp. compound in Victorias City in Negros Occidental. The time frame, during which the imagined Ossorio planned and executed his brother’s wish of creating an artwork for the family chapel, served as a powerful platform to effectively propel the narrative. In his directorial imprint, it was as if Santos were imploring the gods and spirits to save Ossorio from a possible, if not impending, quiet doom. Or salve his wounds and soothe his soul should Ossorio be overwhelmed by the order of his brother. After the audience is shown the distressing sakada existence, bathed by the scorching sun while toiling in the cane fields, the Ossorio brothers, Alfonso (Nel Gomez) and Frederic (Randy Villarama), together with Countess Adelaide de Bethune (with Stella Cañete-Mendoza and Banaue Miclat-Janssen altenating), arrived in the family mansion. As pleasantries with the newly arrived were being exchanged, farmhand Anselmo (Kalil Almonte) collapsed due to exhaustion. The incident prompted Señorito Alfonso to show an unexpected act of kindness toward Anselmo. In a surprising show of affection, Alfonso offered the boy his white monogrammed handkerchief. Here, then, begins the engrossing meandering of the mind and hurting of the heart, grieving over bitter childhood memories, and confronting the confusion and chaos evoked by imagined Ossorio’s relations with his father and mother. Initially, it may be perceived that Señorito Alfonso had been charmed by the young innocent Anselmo, enough for the haciendero to part with his white monogrammed handkerchief. In the bygone days, handkerchiefs were employed by lovers or persons in love to communicate with each other. During those days, handkerchiefs were not used for hygienic purposes, but instead kept for remembrances. Sadly, when lovers send handkerchiefs to one another, this indicates their love has ended. The burial scene showing Ted Dragon (Jomari Jose), Ossorio’s lover, returning a white handkerchief to the painter, was quite moving, with hardly a word uttered. But there was pain all over the scene. Was Ted jealous of the attention lavished by Ossorio toward his painter-friend Jackson Pollock (also played by Randy Villarama), that in the end, Ted gave back Ossorio’s white handkerchief? In one scene, Ossorio and Pollock were deeply locked in an embrace. Back to Anselmo, there were two incidents that provoked the farmhand to threaten to leave the employ of Señorito Alfonso. Yet, he did not, giving an impression that Anselmo himself was beginning to be “pleased” with his Señorito Alfonso. But was this the case? The white monogrammed handkerchief eventually kept by Anselmo’s mother in the family “baul” (chest) and his decision to stick it out with Señorito Alfonso may indicate meanings beyond “professional relationship” between the two. But again was this so? This piece asserts that Anselmo is Señorito Alfonso’s alter ego. Anselmo is the idealized embodiment of Señorito Alfonso’s “displaced persona” in Negros Occidental when his parents sent him abroad to study after he celebrated his 8th birthday. Consider the following: Anselmo had a loving relationship with his mother, while Señorito Alfonso had a difficult one; Anselmo was popular among the sakadas while Señorito Alfonso was not sincerely accepted by his circles of artist-friends in the Hamptons; Anselmo had Inday Trining (Hariette Damole) and the two seemed to love each other, while Señorito Alfonso had a short and tragic marriage with Bridget Hubrecht; and more important, Anselmo kept goading Señorito Alfonso because he believed that Ossorio was “the Chosen One” to create the mural for the chapel of the sakadas. Anselmo was the “confident version” of Señorito Alfonso. 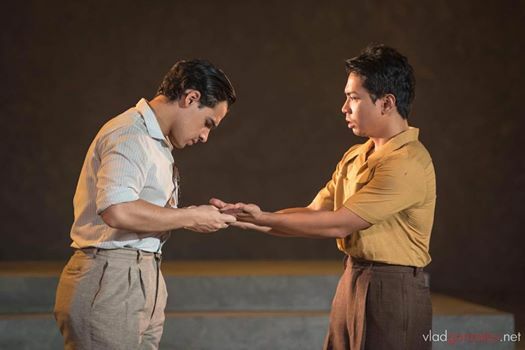 One scene that always elicits strong audience reaction is when Anselmo touches the shoulder blade of Señorito Alfonso in a bid to reassure him and assuage his fears of being inadequate. Señorito Alfonso drew strength from Anselmo. One must also observe that when Anselmo and Señorito Alfonso shared a stage, Anselmo was almost always without slippers while Señorito Alfonso was uptight with his semi-formal attire, be it in the middle of a scorching summer. 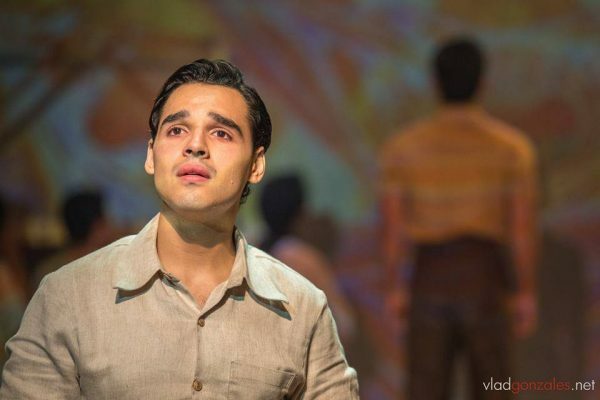 Was Señorito Alfonso envious of the carefree life and freedom enjoyed by Anselmo? 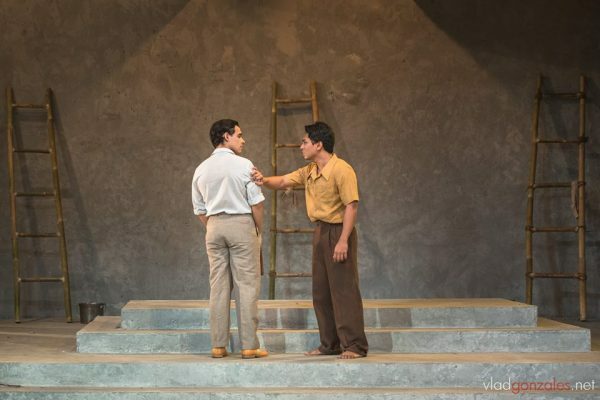 Among the many magical and marvelous scenes, the final scene where Anselmo emerged slowly from the darkened section of the stage to lovingly gaze at Señorito Alfonso, busy working on the mural while lit by Monino Duque like a holy saint, is gripping. Again, no words are exchanged, but the scene is so intense. I was hoping Anselmo would join Señorito Alfonso and both would work together on the mural. But the stage went black. Gomez and Almonte were magnificent in essaying their roles, with the two drawing energy from each other in the five shows that this writer watched. All the other members of the cast: Cañete-Mendoza, Miclat-Janssen, Villarama, Jojo Cayabyab and Julienne Mendoza (as Padre Nunelucio/Jean Dubuffet), Micaela Pineda and Arya Herrera (as Lecturer/Bridget Hubrecht), Jose, Alexander Cortez (Don Miguel Ossorio/Bishop), Neil Tolentino and Greg de Leon (as Jose Nava), Felipe Ronnie Martinez (as Benjamin Valenciano), Ian Ramirez (Dominador), Joseph Nabong (Renato), Rupert Albegas (Ruben), Hariette Damole (Inday Trining), and Ade Valenzona (Anselmo’s understudy) must be commended too for their immense contribution in making “Angry Christ” a new benchmark for Philippine theater. Gino Gonzales’ production design of a newly-built chapel with fresh a coat of “cement” was easily transformed into various locales with minimal props. At the final scene, the chapel became complete when images of the “The Last Judgment” were flashed. Bravo to the video designers: Steven Tansiongco and Josef Garcia. 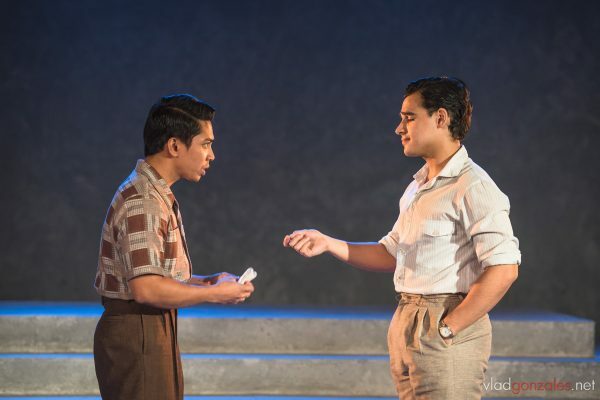 Krina Cayabyab’s choice of local music and American period songs heightened the play’s aural beauty, bringing the audience back to the 1950s Negros Island and Hamptons in New York. Dramaturg Marvin Olaes deserves to be praised for his contribution in making the play coherent. 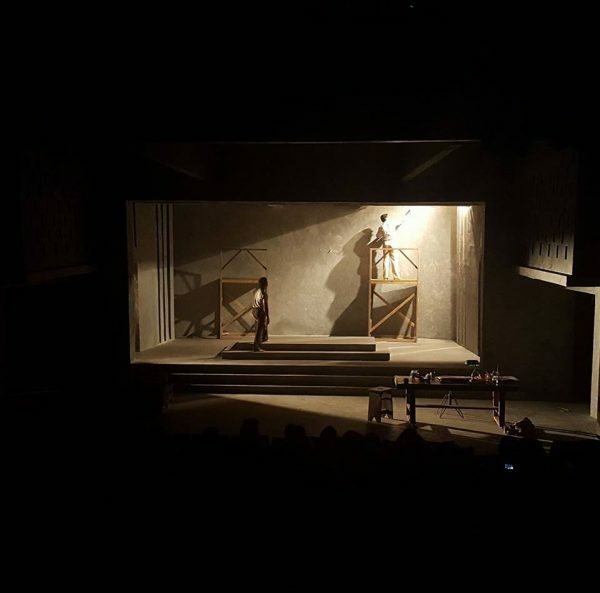 The following must be lauded too: Associate lighting designer Meliton Roxas Jr., Associate choreographer Al Bernard Garcia, and Assistant directors Nour Hooshmand and Charm Aranton. Ibarra C. Mateo is the first Southeast Asian admitted to the Ph.D. program in Sociology of the Jesuit-administered Sophia University in Tokyo. Ibarra set up the Asia Desk of Kyodo News, Japan's largest news, content, and information provider in the Tokyo Headquarters. Upon his return to Manila, he became news editor of Philippine Star. He covered the Malacanang Presidential Palace beat during the Corazon C. Aquino presidency from 1986 to 1992.